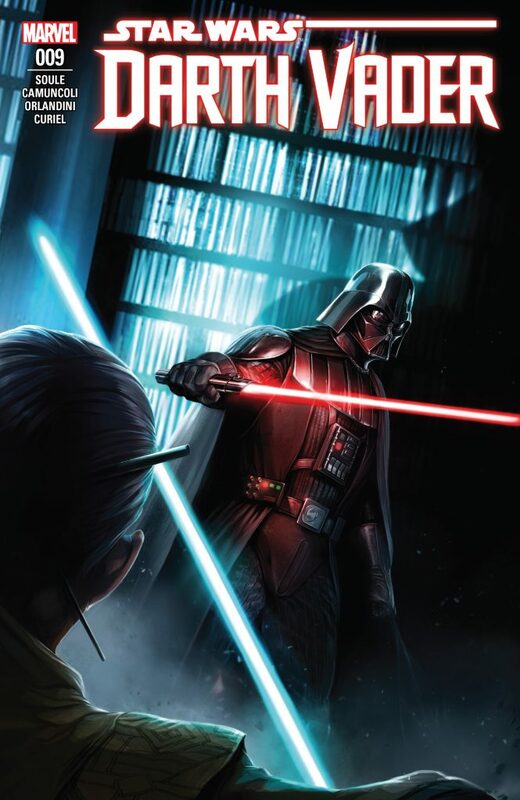 Darth Vader is walking a tightrope between who he’ll become and who he is and clearly not operating within his normal black and white prism, while Jocasta Nu is becoming an unlikely hero of the story. Darth Vader #9 is part 3 of “The Dying Light” and we have reached the point where Nu now finally comes face-to-face with Vader. Prior to that meeting, Jocasta has her own face-to-face with the Grand Inquisitor in the Jedi Temple Archives. Writer Charles Soule keeps this issue action packed almost from page one with plenty of talk of traitorous action against the Jedi between the clashing lightsaber blades. 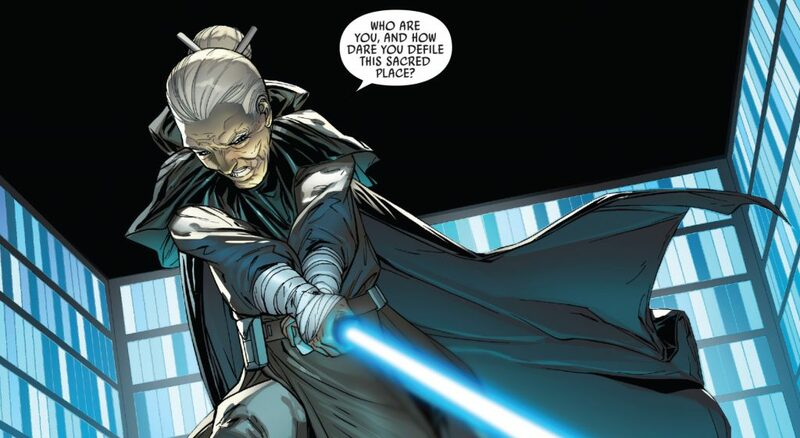 Soule’s treatment of Jocasta’s inability to walk away from letting the Grand Inquisitor defile the sacred temple was the emotional response readers probably felt right before Jocasta made her attack. It’s a slight deviation from the Jedi’s mostly stoic demeanor but felt just right under these circumstances. The amount of backstory we get during their fight will be a treat for readers and a deeper look into who the Grand Inquisitor was and why he became who he is now. The battle is mapped out beautifully and the action is face paced but easy to follow thanks to the art of Giuseppe Camuncoli. His ability to render a top-notch fight sequence is almost unmatched and here is outstanding. 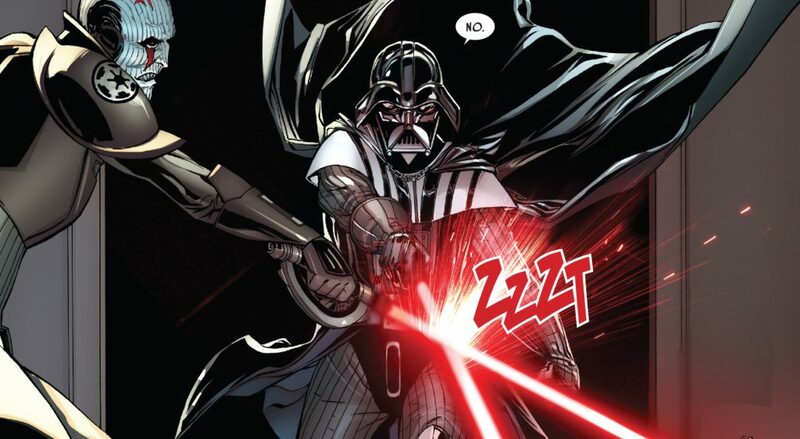 Once Vader makes his appearance it turns the story and readers assumptions upside down. Soule’s dialogue when Jocasta describes her understanding of who Vader is and how she can feel the dark side pouring off him is as poetic as it is dark and uncompromising. When she realizes that it’s Anakin Skywalker under Vader’s helmet she knows something very bad is happening and something desperate must be done to stop it. Soule’s solution to Jocasta’s actions was quite unexpected and puts the idea of the Jedi Temple’s archives in a new light and certainly a new direction. By the time you reach the final few pages you feel like you need to read this issue a second time. There’s so much happening and you don’t have time to catch your breath. In the end, Jocasta breaks out a new weapon and its power is unlike anything, at least stylistically, I’ve ever seen in the Star Wars universe before. This was another stellar issue of Darth Vader from Soule and Camuncoli. I hope if they do a Vader stand-alone film they base it off this series. It’s that good.